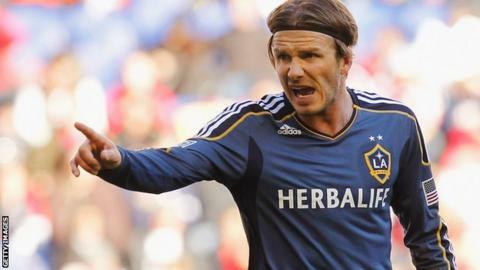 David Beckham's hopes of playing for Team GB at the 2012 Olympic Games remain on course. The former England captain, who will be 37 by the start of the Games, is among 80 players told by the FA they are in contention for a place in the squad. Wales' Gareth Bale and Craig Bellamy, 32, are on the list, as is Northern Ireland midfielder Chris Brunt, 27. Wolves forward Steven Fletcher, 24, who has fallen out of favour with Scotland boss Craig Levein, also features. Liverpool's Joe Cole, 30, currently on loan with Lille, is listed, but only three over-age players are allowed in what is otherwise a tournament for Under-23s. Assuming Beckham is fit, it is understood there is an eagerness on both sides for him to feature. Privately Beckham, aware he will not add to his 115 England caps, has expressed a desire to finish his international career on a greater high than a substitute's role against Belarus in 2009. Having helped to bring the Games to London in 2005, he is eager to be involved in some way. The draw for the Olympic tournament takes place at Wembley on Tuesday, 24 April and, although representatives from all four Home Nations are included on the list, the Welsh, Scottish and Northern Irish FAs oppose the concept of a united Great Britain team. The original list contained 191 names. Manager Stuart Pearce now has to cut the 80 names down to 35 players by 8 June and submit a final squad of 18 players, plus four reserves, by noon on 6 July. Pearce will be unable to select anyone who plays for England at Euro 2012. Birmingham City goalkeeper Jack Butland, currently on loan with Cheltenham Town, is still in contention - as is Chelsea midfielder Josh McEachran. Crystal Palace defender Nathaniel Clyne is included, while Northern Ireland's Chris Brunt, who plays for West Bromwich Albion, also makes the list of 80. In excess of 50,000 tickets have been sold for the opening game at Old Trafford on 26 July and a double-header friendly featuring both the men's and women's teams will be confirmed for a date in July, with the event expected to take place in the north east.